Candidates, are you searching for Data Structure and Algorithms Quiz? Ok, read this article. We attached the Data Structure and Algorithms MCQ Online Test for the imperfect knowledge candidates or even for the faster improvement candidates too. So candidates come and grab all the details given regarding the Data Structure and Algorithms Multiple Choice Questions in detail. Therefore we advise all the contenders to take the Data Structure and Algorithms Online Test and increase your skills. 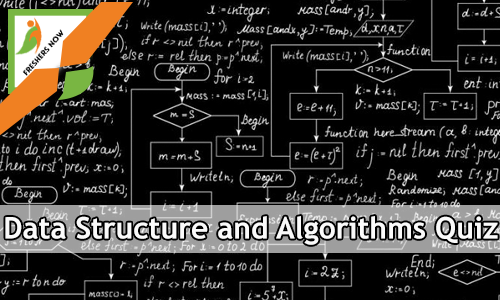 Complete information regarding the Data Structure and Algorithms Quiz is entitled on the current page. Contenders who want to get skills in the concept of Data Structure and Algorithms must check this post and practice well. The table gives you lot more stuff regarding the Data Structure and Algorithms MCQ Quiz. Everyone should take the standard tabular format as necessary information and then proceed to the next section. Moreover, the chart explains the details of the Data Structures and Algorithms Online Test like the name of the quiz and also the type of the test. Furthermore, you can also identify the details like the number of question attained for the test as well the time given for the test. The total number of questions scheduled for the Data Structure and Algorithms MCQ Online Test is 25. Moreover, each individual should verify the time once before continuing the test. Furthermore, each question carries one mark. Also, there is no negative marking. Thus, do not refresh the page. 5. ____ is not the component of data structure. 6. Which of the following data structure can't store the non-homogeneous data elements? 8. Which of the following is two way list? 13. When does top value of the stack changes? 14. Which of the following is not the type of queue? 15. Which of the following is non-liner data structure? 22. Which of the following is not the required condition for binary search algorithm? 23. ____ is not the component of data structure. 24. Which of the following is not the part of ADT description? The concept Data Structure is a systematic way to organize the data to use it effectively and also efficiently. Moreover, the characteristics of the Data Structure are Time Complexity, Space complexity, and Correctness. Below are the foundation terms of the data structure. Interface − Each data structure has an interface. The interface represents the set of operations that a data structure supports. Implementation − Implementation provides the internal representation of the data structure. Moreover, it also provides the definition of the algorithms used in the operations of the data structure. Guides you in writing the correct and efficient programmes straightforwardly. Helps to form the easy way for attempting the Data Structure and Algorithms Quiz. The primary thing the programmers should include in their mind is that they is a timer for the test that runs along with you until the end. And also it makes you speed up the test in time that improves managerial skills in any situation. Engage your coding as well as the logical ability. Also, candidates can implement the programmes easy way. So candidates after successful submission, you should know your results. So, candidates should hit on submit button to obtain results. Then only you can understand how much you are good at the concept. Thus, our Data Structure and Algorithms MCQ Online Test provides the Results either in the form of ranks or even grades. So try to check out all. Finally, all the candidates look at the current page on Data Structure and Algorithms Programming Quiz and for more information keep an eye on Freshers Now webpage.